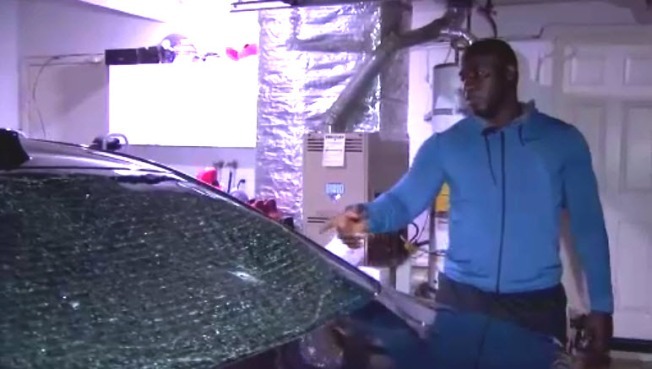 A Bay Area firefighter and former Oakland Raider said Thursday he's counting his blessings after his car was hit by a hail of bullets Wednesday night in Oakland. Joseph Echema said he was visiting his girlfriend around 10 p.m. when he pulled over to take a call. The next thing he knew, his car started shaking when bullets started flying. "It’s just by the grace blessing that I actually survived," said Echema, who played running back at Cal in the early 2000s and went on to play five seasons in the NFL. Looking at Echema’s car, it’s hard to believe he escaped without a scratch. "They say there was anywhere between 40 and 50 shots; police found over 30 casings," he said. His car was hit at least 18 times. The veteran firefighter said he got lost as he was leaving his girlfriend’s house in the 2000 block of 102nd Avenue. That’s when someone opened fire. "The person who was shooting stopped and reloaded," Echema said. "There was a pause in the gunfire." Frantic, Echema ducked, narrowly escaping a bullet that could have hit him in the head. "In the line of work that I do, you see people pass away, you see people in car accidents," he said. "I’ve never been in a situation where I thought my life was in danger." Echema quickly drove away to a nearby fire station, where he got help. Oakland police are investigating, but so far, they say they have no suspects and no motive. On Thursday night, Echema was reflecting on his brush with death. "We have a lot of young men, young teenagers who probably lost their way, don’t know what they’re doing, how they are affecting people," he said, adding that their actions are affecting communities with families that don’t deserve this type of violence.